I'm done!! Me and this cicada flew to me also happy I am sure! I am very happy to share with fellow steemians. The dotting did take time to do but I didn't need a lot of patience because... No deadline!! When I ran out of it, I put my pen down! Yeah, this no deadline really helped. Anyway, here is how I did on day 7 till it was done. There were only few portions left by this time. 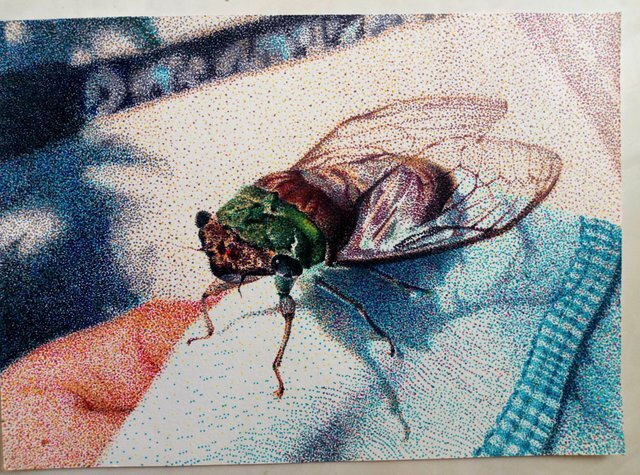 I did added more dots to the cicada but mainly focused more on the unfinished areas. The earlier progresses are in previous posts if you are interested . The background needed to be done. I used gray to follow the pencil lines first. Then dark green and black. It seems to be the darkest spot over here. Gleam and noise added with blue and orange. I don't know what that black pole with a cruvy marks...It was near the beach so maybe oysters stick to black pole?? The last is the wing. I left this the last because this spot is very dark and many structures going on. Used gray and brown first, then maroon and lastly black. Well.. I did go back and forth actually. "Oh no not dark enough..." dot dot dot.
" hey this part is a bit orange-ish!"... dot dot dot. I did few final adjustments. Stick the drawing on the wall with small piece of masking tape and stepped back to see. This always needed to be done to get the whole image. If any of you are interested, here are the steps for pointilism! Find marker pens! It could be one black pen or set of colors. Mine is 20 colors set. Your choice! Find paper for watercolors or ink! Start small if you aren't sure. Transfer the image using pencil lightly! Hyperrealism artist use projector to be exact. Start dotting with lightest colors following the pencil line! Make those dots random and give space in between so it would appear more natural! Mix colors! If green, dot not only green but also with yellow and blue. In a distance your eyes recognize them as green. Go darker and darker but keep the black for the last because you can't erase them. Use black use onlu when absolutely necessary!! 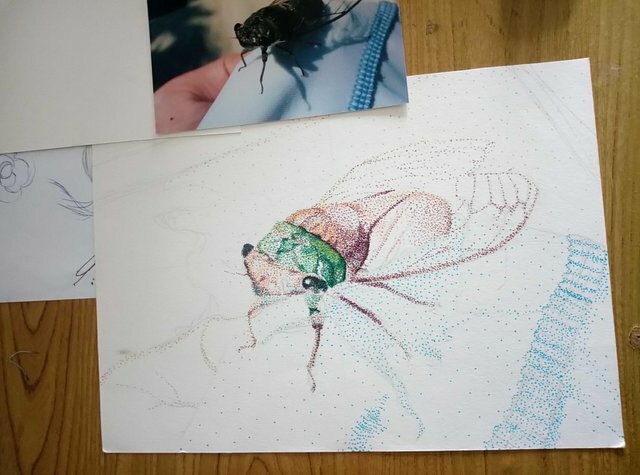 After doing this realistic pointilism first time in dacades, and using a snap shot photo made me think. It had noise that normally you don't percive when you look at things with your eyes. So I was not only trying to reproduce cicada, but appearance only happens for snap shot? It would be a conceptual art if I make it large and focus on those noise, or even magazine prints with printing technology to show. Very interesting. All the works and images are done by me, @naomipangolin. Thank you for your appreciation @fokoit, next one... Not yet decided but thanks again for your encouragement😊! Thank you for your attention @artzone!!! Hi hi @cryptocariad!! Thank you for dropping by😄. The color theory comes natural!! 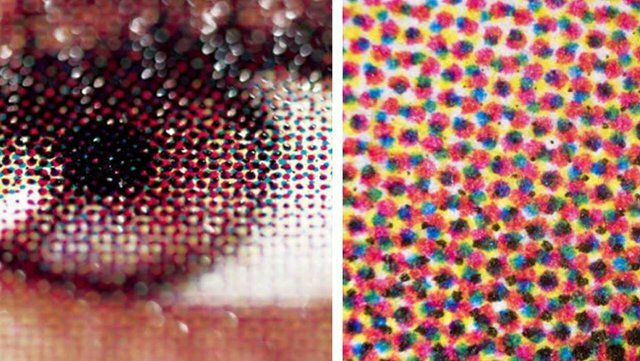 Our eyes blend it and recognize yellow dots and blue dots mix are green. Of course dotting the actual green among them would encourage that effect. You can see this in printing too. It looks great!. 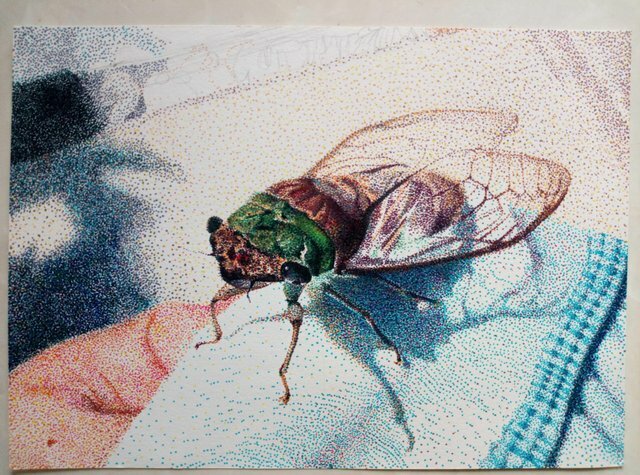 This type of work is extremely complex because it's often forgotten that the essence of pointillism is to let the brain create the degradations and nuances corresponding to certain segments. Here that is clearly perceived. Thank you for your comment @nelsinho! 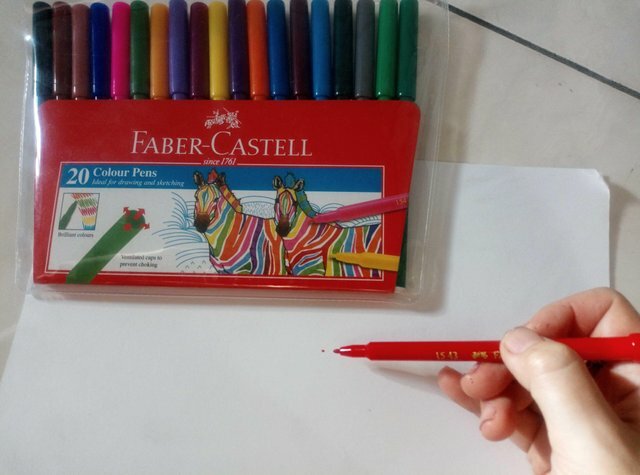 I had a sudden urge to do this, so I simply rushed and bought 20 color sets marker pen, a cheap one for kids from nearby supermarket. Never thought of only use the primary colors, but I do understand your point, just as in CMYK printing . It would be a challenge though. Have you done it before @nelsinho? Wow, all those dots make one beautiful picture. It is interesting to me how you combined the colours together, which is only visible in the close up view, at a glance, the pink dots beside the blue ones are not apparent at all. Congratulations for your curie vote ^_^. Thank you for your appreciation @scrawly!!! Yah, our eyes does do strange things! This could find explanation in science perhaps? Yessss, I know that colour experiment thing! It is true, we perceive the world and colours in such a way that our mind and eyes could be tricked given the right circumstances. In love with your work .. You can not imagine how much I love pointillism, your work is fantastic, in the distance you can see a beautiful painting and when you approach the great amount of points you have and it is crazy "in a good way" ..
Pointillism seems a fascinating technique (I'm not an expert on it) but whenever I try to include it, I have never done pointillism in color, it is always black and white, if I had the right material I would certainly try. I go and check your works too!! Hi @naomipangolin, this was an interesting drawing. I like it very much. And tempted to try it as well. May I know, whether you applied any base color in some portion of the picture? or it purely dotted. I love this kind of drawing because I not good in art. And this would be easy for me to apply :p. So far, I good in color pencil only. I definitely will try this out but first need to get marker pen. You have any suggestion which type of marker pen good for art? I still try to find in aliexpress and I a bit blur with so many of choices and didn't know which one is good. Hi @oliviackl! Thank you for your appreciation and interest!! 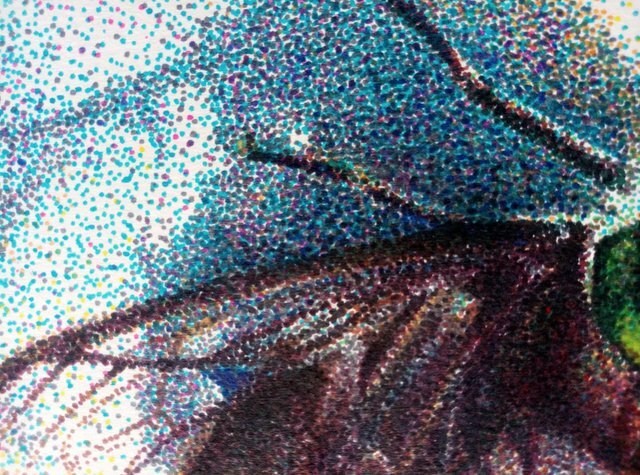 Yes, this is all dots, no pre-colored by paint or color pencils. If you don't rush it with no deadline, and size not too big(it was A4 size), you could also do this easily!! The marker pens I used are these. I believe any marker would work. Mine is about 2 USD for this set, very cheap one for kids😅. Maybe the color would fade easily? The only thing is the size of the dots. If it is very small, it will take forever😅 see if you could test them at the shop and compare which one is comfortable for you. oh.. I have the marker pen same as yours but my dot is a bit bigger 😅. And I don't know how to make use of it because marker pen always a disastrous for me when i do coloring :p. Guess I need to get a small dot like yours to get it started. When you apply the dot, you apply the whole area with the same color first or finish it part by part. Because in coloring, we always color the base first, then only darken the outer layer. How I did is, go from lightest to dark. You have the same marker pen with mine? Its easy to cover up the mistake too, since it is not so strong. Orange is also light, since the bug is in warm color. Also I am checking the balance. Is it dark enough or color strong enough then others? So I go back and forth the whole time. There is no correct way for art making. @naomipangolin, Yes i have the same marker pen as yours only the size of the tip a bit bigger than yours :p. Thank you for the guide. And definitely will take a look on the other 2 links you provided. Yay, can't wait on your future post. Thanks a bunch for your attention 😄!!! Its my first time to see this kind of art. I guess I'd seen many but there are much more many artwork I guess maybe tons? Artists are growing and coming here on Steemit day after day. Anyways, its really a fine art seeing those small dots, very clear and fine. Thank you for your appreciation @ronel! If realistic, super hyper realistic ones, I have seen done in color pencils, acrylics, oil paintings, pastels.... You name it. Yes lots of them out there!! Do you have an art you made on 3D? It will be my pleasure to see it. Oh, I think I miss implied. Sorry 3D in my case is an objects I make😅 using fabrics mainly. Not the one you wear that spectacles to watch. I did make drawings using photoshops long... Long...ago!! But you made it great with a frame. I guess you sell that online? Lol! You are not so off!! Well, I never thought of selling it. If you get to know anyone interested in buying it, I guess I could print it out and post it. Myabe my eyes are getting blurred, your profile photo looks like a girl. When I made that image, I just went back to Japan from the states to start my study, wowed by their technology and stuff I guess. You did great with that little creature. It is very cute! 😊 You're truly a great artist! The last time we "spoke", I was staring at your wheel made of fabric. Now this very unique art. So that is called pointillism. Interesting! It is my first time to come across such word and type of art. Thank you for your appreciation @macoolette!! My art teacher tought us to do many kind of art as we can, to let others know we could do this and that, but at the end we chose and specialize on particular art. So mine is fabric art, just came back to this for meditational purpose. I am surprised to know steemians are interested! Thank you so much @wisejg!! So glad you like it, worth a lot of...dots! Lol! Hola @naomipangoling, te felicito por tu bello trabajo terminado, por tu voto @curie, y también eres ganadora de una acción SBI de por vida, fuimos unas de las ganadoras del concurso, pay it forward, que sigas alcanzando mucho éxito en este inmenso mar de Steemit, un fuerte pero cariñoso abrazo. Hello @naomipangolin, how are you? you have left me amazed with your technique of pointillism, I differ with you in that it is realistic in the good sense I find it more towards the side of impressionism, by the saturated use of light in some points and then a shadow poderoza I can notice that the scene is a place to the outside where the hard light of the sun has bathed the lap the cicada and part of a cloth, and that is common to find it in impressionism whereas in realism the light is more tricky and the backgrounds are dark. on the other hand I'm fascinated by your mixture of colored dots gives the feeling of three-dimensionality and transparency in the wings seem very clean and clear to me, the details of their articulation and colors are indeed very similar to reality, maybe there if I accompany the call realistic work because if it looks like a photograph. Clean work, very careful details and of course all time spent was worth the wait. Thank you for your thoughtful comment @arrozymangophoto! You are so correct on impressionism, which the well-known would be Georges Seurat the French painter. He use light blue for the main clolor, I use yellow and orange. And you are also right about this looks like a photo, well, it is from photo. This pointilism was a kind of a meditation for me, because by following the photo, I knew what to do. 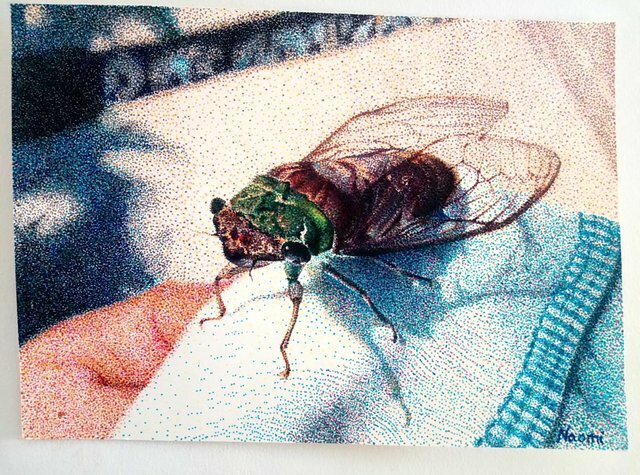 Also realized that whether I am drawing cicada or photography itself? because the snap shot I used had noise that human eyes do not perceive. It only appears on photograph. So I was drawing photograph itself in that sense. I am normally making soft sculpture and batik now, and my first pointilism in 20 years. I had a terrible friendship breakup last month, and I really had to relax myself. And surprisingly many steemians are fascinated by this! I am very happy now, by sharing this, also I get receive many comments! I loved to see the progress and it is my honor to see the final product. This technique looks so difficult and requires a lot of time and patience. And not only this. I think it also requires a lot of imagination and a good feeling for colors. You use so many that it could go very wrong but the way you use them makes it look realistic. I like that you share your know how with us and I'm sure that this will encourage some artists to try it. I might even try it as well. Not on such a difficult pattern of course but something easy such as an apple or an orange :) I'm glad that you recommended type of the paper as I would struggle to choose one. Thank you so much @adamada!! Really you do pointilism too? Do you have them in your post? Well, actually I don't know if I could call my self patient, because no deadline, that did the trick you know! When I didn't feel like doing it, I left it on the table and I gave a side glance ehehehe. When I didn't feel like doing it, I left it on the table and I gave a side glance ehehehe. I tried pointilism but was unsatisfied with the results. Your work only shows how I'm so not cut out for the technique. I don't have them in my posts for shame of the results. It's really that bad. Well, honestly, we never know what others would think. Many of my work, I thought it wasn't that good turned out to get much applause. The work I thought was good, didn't get much attention. It's always surprise and disappointment. Maybe you gave up on it too early? Give it a shot? So I only have to follow and tag when I make new post? You have to post under their platform to let them see your posts. 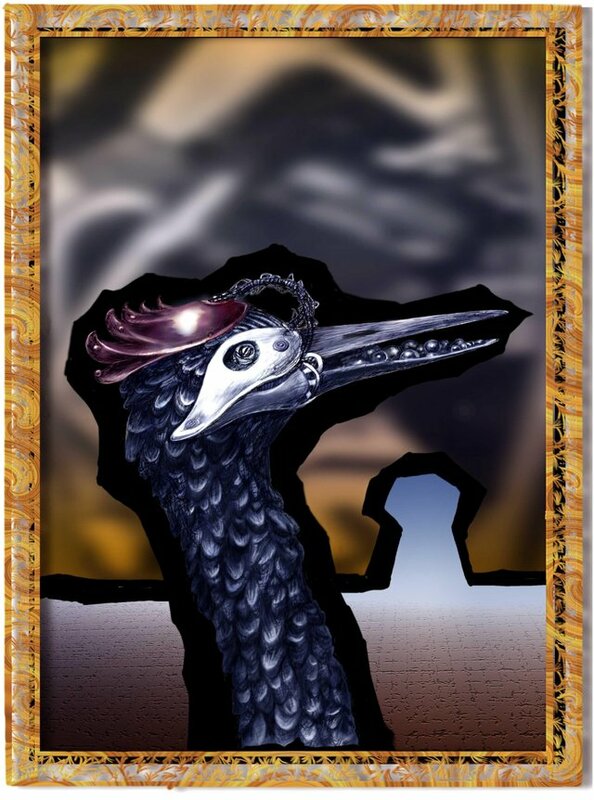 It's on www.artisteem.com you need to sign in with steem connect. Do you have a discord account? you can get to know more about the community there. Yeh, I do have discord. Thanks @adamada, I go see their website right now! This looks so detailed and "alive", I do love how captured those really little details in your drawing, even the shadows... It is really nice. So, it took you 9 days to get this done? You really are patient. Well, art requires that, right? Thank you for your comment @audreybits!! Yes, but not doing it for 8am to 5pm!! When I wanted to do, I start. When I got tired, I stopped. My soft sculpture needs 2 months to finish. I am looking after my family so I do it a little by little everyday. Yes, you are right, I have to be patient, but I had to learn to care family and art making together.